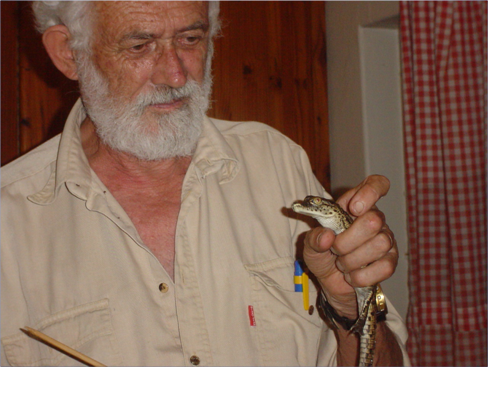 The Fritz Huchzermeyer Veterinary Science Student Research Assistance Scheme (FHVS-SRAS) has been developed with the specific goal of encouraging and assisting undergraduate and post-graduate students to undertake formal research to advance crocodilian veterinary science. The CSG recognizes that crocodilian research often involves a greater commitment of resources and time by students, relative to many other subjects, and believes that this justifies efforts to assist. Research gives students the skills needed to assist crocodile veterinary science and to become active CSG members in the future. The FHVS-SRAS will provide up to $US1000 per year to a project, or divided among multiple projects, that meet the criteria for assistance. The grant is not designed to fully fund projects, nor to sustain them over years, but rather to provide some direct financial assistance to students during their study. Students are encouraged to use the CSG funds, and the "CSG Approved Project" status, to try and lever more project funds from other sources. Successful applicants must provide a summary report or update on their project to the CSG within 12 months of receipt of FHVS-SRAS funding, for publication in the CSG Newsletter! A photograph of the applicant should also be provided for use on the CSG website. Receipt of the grant in one year of a project does not infer that funding will be provided in subsequent years. The aim is to use the fund to assist the maximum number of students possible. If funding is sought for a continuation of a project, the outcomes/results from the previous FHVS-SRAS funding will be essential to the application even being considered.